Processed foods are increasingly singled out as the main culprit in the global obesity epidemic. Food manufacturers pursue profit at any cost, waists grow, diabetes rates reach the all-time high. Producers produce, consumers consume, but once in a while someone publishes a book intended to question our eating habits. Eric Schlosser's Fast Food Nation immediately springs to mind, or Michael Pollen's The Omnivore's Dilemma. This year, Michael Moss's Salt Sugar Fat proudly joins the selective club. The very title tells us a lot about Moss's strategy in challenging the processed food industry. His notion is simple. We eat too much salt. Too much sugar. Too much fat. Overabundance of those three ingredients quite visibly makes us sick. Unfortunately, the same unholy trio is also responsible for making our food taste great. The heavier, the sweeter, the saltier it is, the more we like it. The more of it we buy - and food manufacturers want us to buy more, always more. Moss digs deep into processed food industry to expose all the tricks compelling us to eat high-calorie products. He provides tons of data on food science, marketing strategies, government regulations (lack of, usually), sales figures, health statistics, interviews with food corporation executives, you name it. Salt Sugar Fat is a goldmine for food research reference. As is usually the case in this type of publication, pretty much every sentence is documented. Food industry employs expensive lawyers which, I'm guessing, is the main reason for such scrupulosity. It does, however, enhance the book's reliability and makes further exploration that much easier. Even with all the safeguards in place, Moss's wording is very careful. 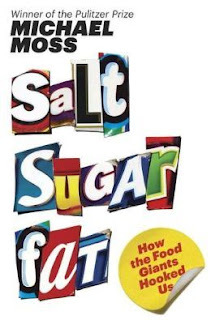 Salt Sugar Fat is not an all-out crusade against processed foods, not obviously so. Yes, the dangers of overdose of each targeted ingredient are outlined in detail, but so are the efforts of major companies to minimize the negative impact (whether apparent or real). We are introduced to numerous 'good guys' in the food industry and shown amazing science facilities dedicated to making food not only tastier, but also healthier. We are told how devastating any limits on salt, sugar, fat would be for the end product. Sure, criticism of greedy corporations is there, but it is offset with their efforts to make it all better. Perhaps it is just journalistic objectivity (which always deserves praise), but I am not sure if in its present form the book serves its avowed purpose. Reading of all the greasy, sugary deliciousness, I felt an overwhelming urge to go out there and get some junk food, something I normally avoid. I also got confused as to who is the bad guy in this story. Because if the executives are trying so hard, whom should I actually blame for the raging obesity epidemic? If Moss is pointing a finger, he does it very half-heartedly. The conclusion of Salt Sugar Fat is simple, true and similar to the findings of Schlosser, Pollen etc. Only you, dear eater, can save yourself from your diet. No government will do this for you, no big business will suddenly ditch making money and switch to saving humanity. Consumer's choices are the only way out of the current food-induced health crisis.